Filing bankruptcy doesn’t mean you’ll never qualify for credit again. One of the purposes of filing a bankruptcy case is to eliminate burdensome debt so that you can get a fresh start. One of the first questions a client will ask after filing bankruptcy is ”Will I never be able to buy a house [or a car]?" Of course you will, and probably sooner than you think. Some lenders, like credit card and some car creditors, will take a chance on you right after you emerge from bankruptcy. You’ll pay a higher interest rate, and the terms may not be as favorable as you like, but the credit is available for most former bankruptcy debtors. It’s not as easy when you’re talking about a big-ticket item like a house. Mortgage lenders and guarantors want to ensure that they won’t compromise resources by lending to someone who’s not ready for the responsibility of homeownership. Therefore, they usually won’t approve loans just after the borrower gets a bankruptcy discharge. There will be a waiting period that can be as little as one year or as many as four years. During that waiting period, you must keep your new developing credit record clean. If you run into trouble, you might have to restart the clock. For instance, if your mortgage is foreclosed a year after your bankruptcy case is discharged, you’ll have another waiting period before you can qualify. Beyond that, every lender or guarantor has its own set of guidelines. Your first step should be to check your credit reports. You can get a free copy of each of your reports once a year at www.annualcreditreport.com. Use the credit reports to ensure that your discharged debt is listed as "included in bankruptcy." Any credits cards that were discharged but don't show it, can hurt your credit even further. Once you're sure your credit reports are accurate, consider getting pre-qualified for a loan through your preferred lender. With bumps and bruises on your credit history, you may be required to provide explanations or produce proof that you’ve re-established good credit. This can take time. Pre-qualification can help save you from much frustration when you find the home of your dreams. Let’s explore the additional requirements you'll have to meet for some of the most popular lending programs and insurers. FHA has separate guidelines for Chapter 7 and Chapter 13. Chapter 7: If you filed a Chapter 7 straight bankruptcy and received a discharge, you’ll have to wait two years from the discharge date before you apply for an FHA backed loan. But that’s a minimum. FHA doesn’t provide loans directly to consumers. It guarantees loans made by commercial banks. 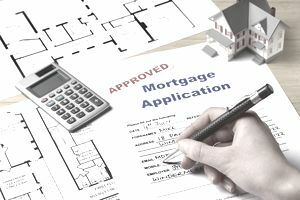 Often the banks will impose qualifications or minimum requirements that are more stringent than what FHA or other government agencies have in place. Many banks require that you wait three years before applying. Chapter 13: Good news here. In a Chapter 13 case, you’ll make payments through the court for three to five years to pay down or pay off your debt. You don’t have to wait until two years after the bankruptcy to apply. In fact, you don’t have to wait the bankruptcy is over. As long as you’ve made your Chapter 13 payments on time for a year, you can qualify for an FHA loan. While you’re in a Chapter 13 case, your financial life is governed by the bankruptcy court. Even if you’re approved by your bank and by FHA, the bankruptcy court and the Chapter 13 trustee will still have to weigh in to ensure that you’re not taking on a bigger obligation than you can manage. Learn more at FHA Loan Rules for Borrowers after Filing Bankruptcy. The time requirements for a VA loan are similar to those required by FHA, but with more hoops to jump through before approval. Chapter 7: Two years after you received your Chapter 7 discharge, you can apply for a VA loan. During that two years, you have to take steps toward re-establishing good credit. You will also be asked to provide an explanation for the Chapter 7 bankruptcy, and to show that your income is stable. Chapter 13: You must show a year of on-time bankruptcy plan payments to qualify for a VA home loan, and you must obtain bankruptcy court approval. Here’s a good overview of the VA loan process: VA Loan Approval after Bankruptcy or Foreclosure. Most conventional loans in the US are owned by or insured by the government sponsored enterprises, Fannie Mae, Freddie Mac, or Ginnie Mae. These backers have similar loan eligibility requirements for borrowers who have filed bankruptcy cases. These are guidelines. Your mortgage lender or mortgage broker can help you with the specifics. In addition to a waiting period, these organizations require that borrowers demonstrate that they have re-established credit after the bankruptcy. Chapter 7: The waiting period is 4 years, or 2 years with extenuating circumstances (those outside the borrower's control). An example of extenuating circumstances would be a layoff and extended unemployment, or medical issues. Chapter 13: The waiting period is 2 years from discharge and 4 years from dismissal, or 2 years from dismissal with extenuating circumstances. If you have more than one filing within the past 7 years, the waiting period is 5 years from the most recent discharge or 3 years with extenuating circumstances. Check out this fact sheet from Fannie Mae: Borrower Eligibility Fact Sheet. And this one from Freddie Mac: Underwriting Reminders. Although the vast majority of home loans in the United States are owned or insured by one of the agencies listed here, it is still possible to get a loan from your local bank without agency involvement. In those cases, the lender will establish its own lending criteria for people who’ve had to file a bankruptcy case or had a prior foreclosure, short sale, or deed in lieu of foreclosure. You'll need to check with the individual financial institutions.